Direct mail has always been a strong medium for many marketers, and the emergence of new technologies gives marketers new, exciting ways to communicate their messages. By incorporating technology, recipients can engage with a mailer via their smart phone or tablet, seamlessly blending the world of print and digital. The question then, is what technologies exist? 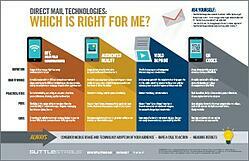 Is direct mail technology the right move for my marketing? If so, which technology is the best fit for my goals, audience and message?